Spring is almost here. Soon the warm winds will be blowing through, bringing with them all the sounds of the springtime. From birds singing to bees buzzing, spring is filled with delightful music. The sounds of spring can be made even sweeter when you have a beautiful Minnie Wind Chime hanging outside your window. I just love the sound of the clanging chimes as they gently blow in the breeze. 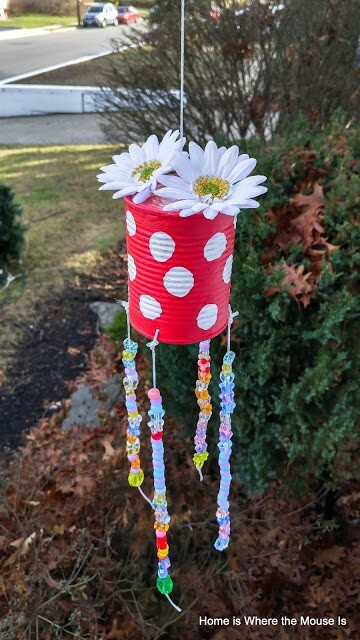 Get your home ready for spring by making this kid-friendly wind chime craft. 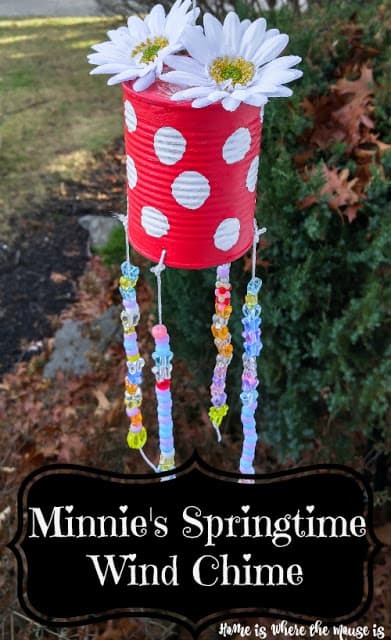 Minnie’s Springtime Wind Chime is a fun craft that will help welcome spring. Even better, it can be made almost entirely from materials that you already have around your house. Once the can is cleaned and dried, turn it upside down. 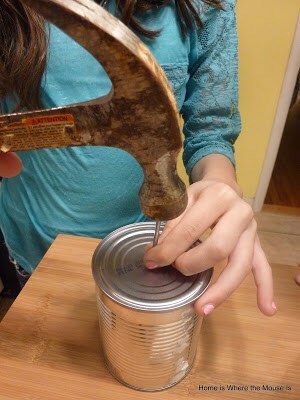 Place the nail in the middle of the can. Gently tap it with a hammer until you hear a “pop” and a hole is created. 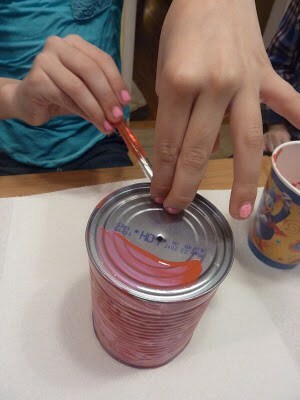 Following the same method, poke 4 more holes around the rim of the can. We did one on each side. It’s a good idea to place a block of wood on the inside of the can while you’re doing this. It will prevent the can from bending. Next, paint the outside of the can red. You may need to do several coats. If you are planning to hang your wind chime outside, you need to use an oil based paint. It also may be a good idea to seal it with a clear paint sealant. If you are planning to hang it inside, a water-based paint may be used instead. 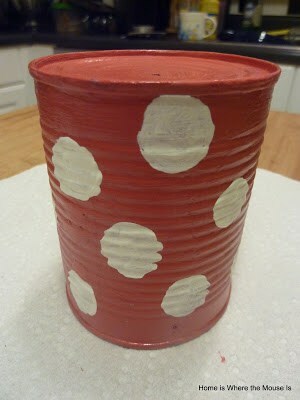 Once the red paint is dry and you are satisfied with the color, paint white dots all over the can to mimic Minnie’s dress. 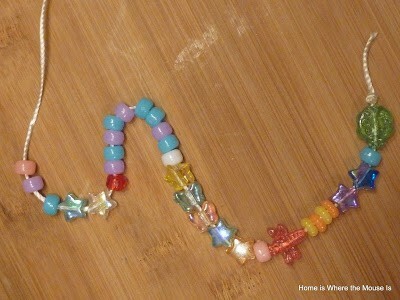 While the dots are drying, string your beads, chimes, bells, whatever you have chosen to be your chimes. Cut at least 6 inches of string to make sure you have enough room to place your chimes and that they will hang nicely from the bottom of the can. Knot the ends tightly to prevent your chimes from falling off. Tie them to the can. Tie 2 washers to the end of another string. Thread the string through the hole at the top of the can, inserting through the inside of the can. 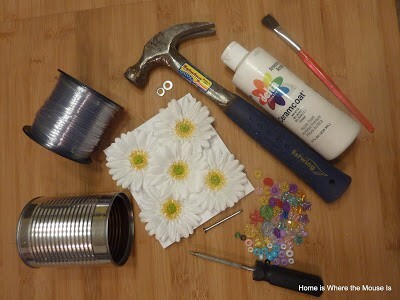 Glue flowers to the top of the can. Now all that’s left to do is hang it and wait for the spring breezes to blow! You could easily modify this project to celebrate your favorite character. Use a color blocking method and paint the can your characters color. For example, to pay homage to Pooh, you could paint the top half yellow and the bottom half red. 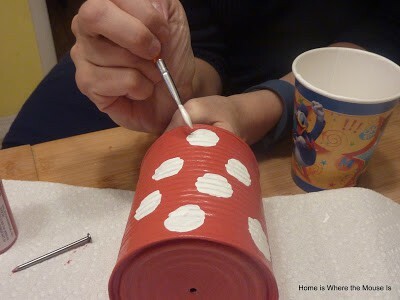 Follow Lisa&James | Home is Where the Mouse is | Disney Tips’s board Disney DIY and Crafts on Pinterest. Nice idea! It is so cute to decorate house.